If you're in the market for a new off-road bike in 2014, you can never do enough research about which bike to buy. Video reviews are a great way to learn more about how a bike handles and whether it might be a good choice before plunking down thousands of dollars for a new dirt bike. 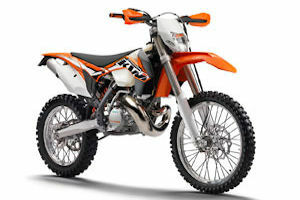 This 2014 KTM first ride video offers some very helpful information from Dirt Rider Magazine's Chris Denison. Chris highlights some of the revisions to the 250 XC-W and 300 XC-W two strokes as well as the 250 XCF-W and 350 XCF-W four strokes at the Rattlesnake Enduro in Pennsylvania. Dirt Bikes 101.com is a participant in the Amazon Services LLC Associates Program, an affiliate advertising program designed to provide a means for sites to earn advertising fees.